I know. I know. It sounds like the most on-the-fence and noncommittal event to be held in the history of events. To tell you the truth, I was as unsure of it as the name itself, but it’s growing on me. 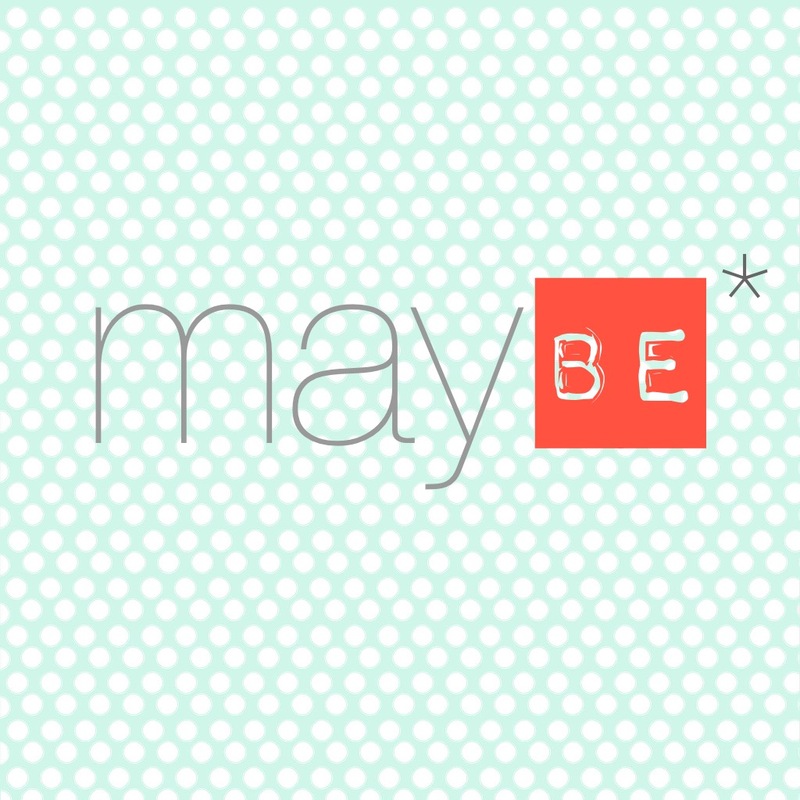 I am more of an optimist these days and I look at the word maybe as the compound word that it is – MAY | BE. Put together, it is an uncertainty. And since nothing is certain, let’s celebrate this uncertainty. Let’s celebrate through expressing our creative potential and by trying new things, uncertain of the outcome – dwelling simply in possibility. So this is the name I have come up with for my little project. Here’s the deal. I just want to make something every day. Something. Anything. I’d like to unleash my pent up creativity that I have been using solely for homeschooling lately. On this blog, you will find one creative prompt a day in May. You will also find stories of people who have inspired me creatively and who also have embraced creativity as a part of their lives. Some are artists. Some are mothers. Some are fathers. Some are families. Some homeschool. Some are just wildly creative in all that they do. I didn’t want to be alone in designing and facilitating this mayBE. I needed some companions on this journey. Other stories of wonderfully creative activities and stories of different creative journeys. Today is part one of preparations for this project. If you choose to accept this invitation to mayBE 2015, with start date of May 1, 2015, you must prepare your “sacred space” which I talked about yesterday. Whether it’s a small space of your dining table, at a desk, moving a small side table by a window, or even choosing a pretty blanket to lay out on the floor, define your space. This not only give you a place to go to complete the prompts, it is also a signal for yourself and your family that you are dedicating time to create and to explore. You can also create a family space if you want to do this with your whole family. – OPTIONAL: scraps of paper, and any other crafty stuff you might have stashed away or that you have for the kids. This month, you are going to PLAY. 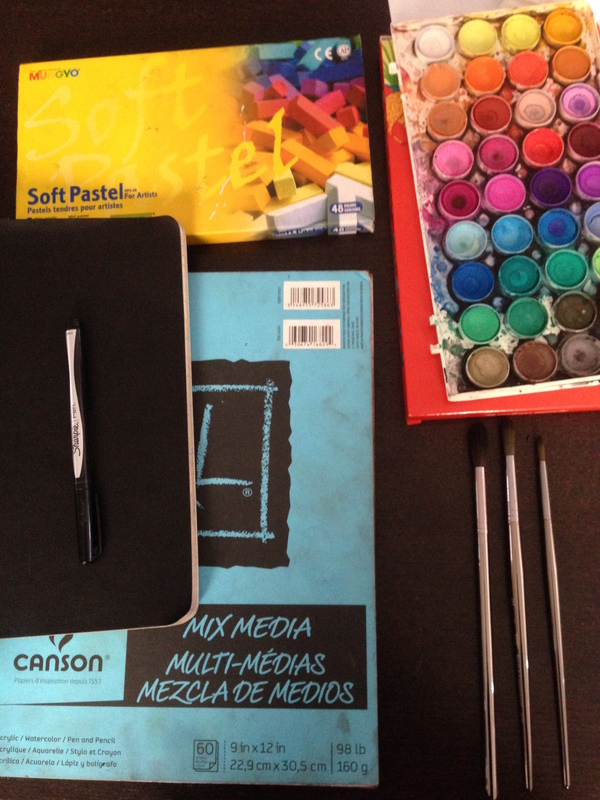 **Don’t be intimidated by art supplies. Not every creative prompt will be visual but a lot of them will be. Use what you have at home. I am sharing what my family likes to use. We also purchase acrylic bottles from the dollar store and use kraft paper too. Use what you have. But if you’d like to create a small space for yourself to create, you may want to have some supplies for yourself too. Tomorrow, I will post how to prepare for this project internally and possibly address any questions or objections that you may have. What are my expectations? What are your expectations? What are my intentions for this project? And my favourite question of all, what exactly is the point? I may join you, and bring the guys along for the ride. Caelyn and I are excited to participate. Please count us in! Next post: mayBE 2015 preparations. part two.